What a beautiful way to celebrate this weekend. Got to see the city from angles I hadn’t before. Got to do more than I ever could on my lonesome through collective effort. Brought out the same in others. Reflected on service and sacrifice. And the weather was with us, too! After initial forecasts of an 89% chance of rain and temperature in the upper 30s to 40s or so, we were basically in the 40s through the night, with relatively clear skies. To start, we ‘formed up’ for what appeared to be a fairly mellow administrative process. 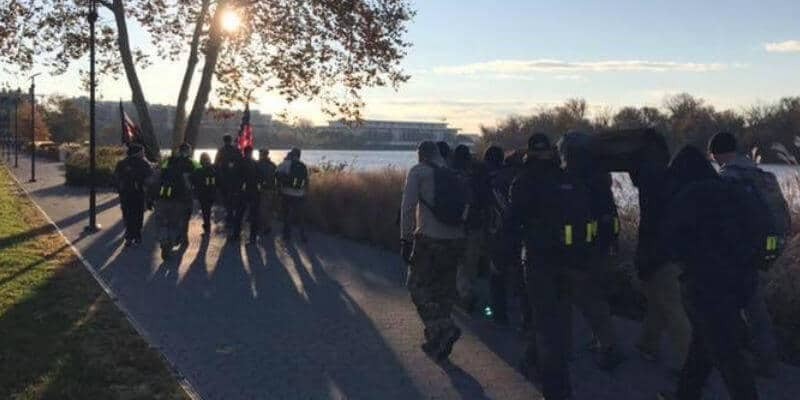 No one _didn’t_ have what they were supposed to, and we had a nice mix of experience levels, including a few newbies and several more experienced Ruckers, such as Paul and Chad Capital’s Lorton, but especially a fellow whom I would later find out went by the nickname Warrior Chief, for whom this was his 51st GoRuck event. Cadre Rob introduced himself. 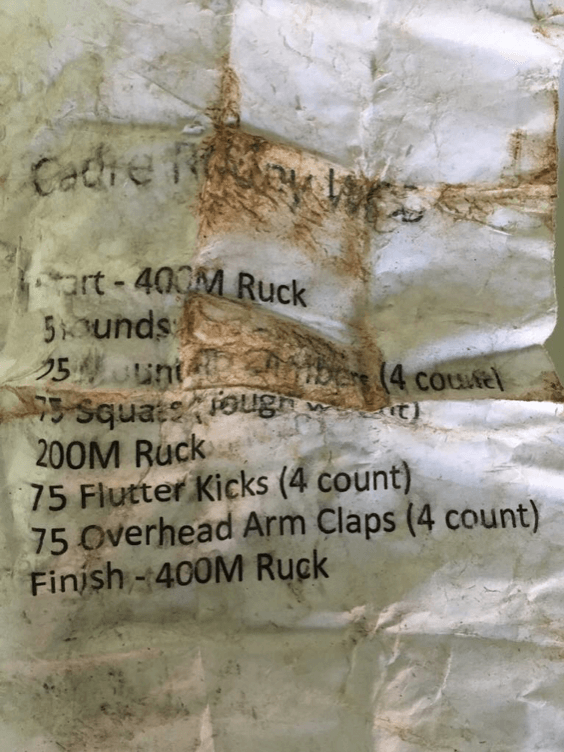 The Cadre is the GORUCK employee running things, with a series of ‘missions’ and PT challenges for us to do. Cadre Rob had been in Marine Reconnaissance. He asked for newbies, and for any two to step up, so I volunteered and became the team leader with Chris, a red-haired parkour dude, in the role of assistant team lead. Our first mission was to ruck from the WWII Memorial to the museum of natural history in 16 (or 18?) mins or fewer. Once there we were to find a field where we could walk up and down for 200m so that we could do a WOD in honor of Cadre Rooney, who is battling stage IV pancreatic cancer. The mission went smoothly enough – it was weird to be telling folks what to do, and I benefited enormously from Warrior Chief tell me where to locate myself in the role of Team Lead (halfway back, so as to be able to monitor my people, while assistant team lead (ATL) brought up the rear. We encountered some fencing we had to flank and took our first potty break, at a public restroom by the Washington Monument (during which time was paused) then moved along from there. Having a sense for pacing, I had us double-time it for the last half a block or so, both to make sure we made our ‘time hack’ (allotted time for the mission) and to warm folks up a little for the service WOD. We made the time hack by 20 seconds or so. Had we failed to make the time in our mission to the Natural History Museum, I presume there would have been some sort of additional Physical Training (PT) assessed to the group. This piece of paper is tore up because it was wet and muddy out yes, but also because as team lead I was checking it continually to make sure we weren’t missing sets or anything. As you can see many of the exercises were for a 4-count. All were performed while wearing the 30 lb ruck with 3 liters water etc. I can safely say that I have never seen anyone (including myself) so happy to bang out 75 squats in my life, since relative to the other exercises, for most of the group, this was the ‘recovery’ set. Warrior Chief started us off by counting the cadence and set the precedent, which we stuck with, of breaking each 75-count into 5 sets of 15 reps with a brief recovery in between. As Team Lead I then sought a volunteer to call the cadence for each exercise. On the first round I had us start to jog our way back and was told by the group and then someone specifically ‘it’s a ruck not a run.’ So from then on, we walked to either end. Fairly early on someone noted that flutter kicks and mountain climbers were made easier if we had a less-permeable/ muddy surface, so we set up on a sidewalk when possible or along the gravel path of the Mall at either end of our 200m field. At one point in the 2nd or 3rd round, folks got a little giggly and someone called out to point out that while it was all fun, they asked that we remember why we were there, and a steadier mood was maintained. Having concluded the WOD (which may have taken 90 mins or more – neither watches nor phones are allowed and it was at least 10 o’clock by this time, so I don’t really have any idea,) I asked Cadre Rob what was up next and if the TL/ATL positions were permanent or rotating. He informed me that they would rotate through the night and promptly ‘fired’ us both, relaxing us with two other newbies. At the Capitol, Cadre Rob shared some about what it means to serve our country and make things work, and of course that so often it does not appear that those in the Capitol are able to make that happen. 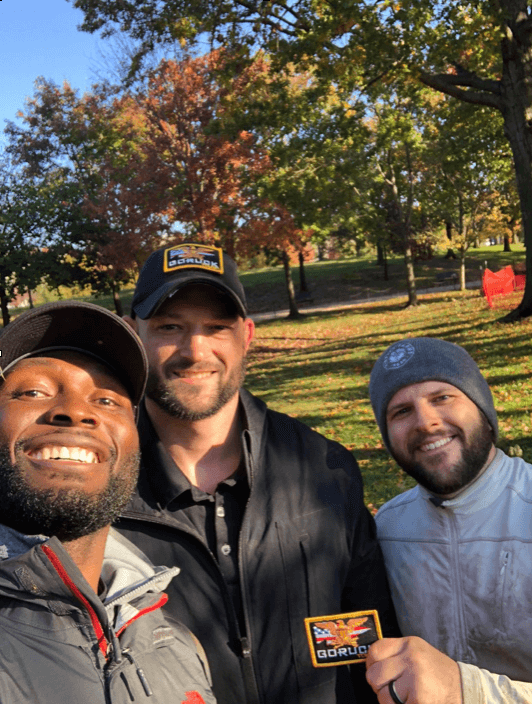 He took the opportunity to note they in the military as in GORUCK there’s just working together, regardless of one’s leanings or affiliations. He had us sling our rucks across the crooks of our elbows and interlink arms in a circle in preparation for another WOD. Pause squats to the tune of ‘Flower’ from Moby’s album ‘Play’. Squat in each sung ‘down,’ and come up on each ‘up.’ So, ouch. At the barracks, we both made our time hack and didn’t mess it up. I was struck at both how tall and truly baby-faced the half-dozen marine guards were; I seriously doubt whether any could grow a full beard. They seemed amused to see us. At this point Cadre Rob opened the floor to veterans, seeking a Marine to speak, given our location. Joe, whom I would later learn is 59 with a 17 and a 7-year-old, shared that he had been in the Marines from ’81-’85, and that boot camp had really been the best of it for him. He further shared that his son had expressed that he might go in and that he had been firm with him that the boy had to complete his education first, since, on the basis of his experience, it was always better to go in as an officer. Better to be the one giving the orders than to be a peon, were his words. And, Cadre Rob added, (again formerly of Marine Reconnaissance,) to be worthy of command rather than just taking orders. At this point Cadre Rob introduced our first ‘casualty’ and advised us that our next mission would be to get to the naval medical library(?) he schooled us that there were a few ways to carry a casualty, basically: 1) the fireman’s if you’re on your own/ have only a short distance to carry and 2) a 3-man carry (2 supporting the arms, 1 supporting the legs) if you need to go further and have those people. We made this time hack well early, in part because we were not able to get into the Navy Yard, and took a little break for potty and refueling, and some folks to fill their water from the Jerry can. (A clock atop a building indicated the time to be about 1:40 am) Cadre Rob shared the story of a colleague of his who ended up as a corpsman (highly qualified field medic that has to go through multiple basic and advanced trainings, including dive and airborne type schools) and a silver star (I believe) honoree due to his shooting of a rogue Afghan attacker behind the line on a base. But he shared too that this individual had initially quit one of his training when he just couldn’t take being in a submersion tank anymore. In effect his trainer gave him a second chance. On a level Cadre Rob expressed that he felt certain that day would not have been the gentlemen’s proudest. But had he not had that day, and the motivation that came with it all the days after, he would not have been on site to stop the rogue element and treat the wounded and coordinate their medical evacuation on that fateful, later day. Next we were assigned 3 casualties, and to get them to Nationals Park. Chad became navigator and possibly also team lead. We made this time hack and at the Yards broke for potty and 25 ‘bodybuilders.’ (A new movement to me, but basically, a slow-motion burpee with a split jump added: jump back, push up, split jump, bring legs back together, jump up to front and clap.) Sets were reps of 5. On the first couple of sets my abdominals cramped aggressively – whether a product of over-stimulation or modest over-hydration / food intake I don’t know – but in the 2nd or 3rd set I just tracked off Paul, who was doing the exercise to my left, and stabilized my core so there was less contraction involved, and it went away. Our next mission was to the tidal basin, which took us across SW. once there we pushed on to the Korean War Memorial. There we paused to take that memorial in and Cadre Rob covered the extent to which the war as forgotten, had not been something for which the military or the population was terribly well prepared. Then we went on to the Lincoln, where we refilled our waters from the bathroom there, then bunny-hopped the steps, (I had the Jerry can, and used it as a crutch/ assist on my hips,) and took a group picture. Then we were told to low crawl 20 yds and bear crawl a further 20 through a muddy field. My abdominals flared up again, but nothing unmanageable. 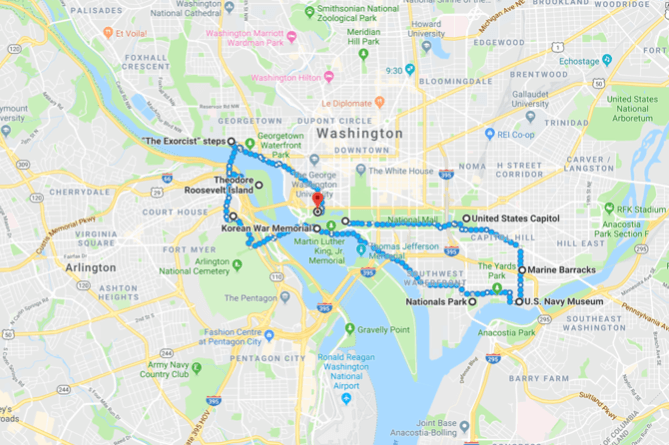 Our next mission took us through Crystal City, I think, and ultimately to Roosevelt Island, where I don’t think I had ever been. Increasing traffic as we had left Iwo Jima, and the first other humans we had seen all night, tipped us off that we might be approaching dawn. Crossing the bridge to Roosevelt island it became clear that the sun was just over the horizon. We settled in there for a moment, and Cadre Rob asked 10 folks to step forward and come with him. A few minutes later, more or less as the sun was breaking the horizon – not yet visible through the trees – they re-emerged with a log of about 12-14 feet in length and 18-22” across. Maybe it’s my sense of humor, but I really appreciated this inversion of ‘it’s always darkest before the dawn.’ As someone noted: ‘so, this is when the s–t hits the fan.’ Warrior Chief noted that it was dead wood, and so wouldn’t be as heavy as if it were fresh. We rested for a bit while Cadre Rob talked and had another veteran, Kevin, speak. He talked about his role in one of the earliest forms of military communication, music: he is a saxophonist in the marine band. At some point shortly after he spoke here was the only moment during our evening when I nodded for just a moment. I had resisted the temptation to sit on the log and sat on one of the granite lark benches instead. I set my posture up and stood so as not to doze again. We made it across the Roosevelt Island bridge and up the ramp we had come down to complete a relatively tight turn. I was on the flag (at the front,) at this point and it became clear that with the load and any incline we would have to ‘zombie walk’ at a slow pace to keep everyone together. We made our way up to the Francis Scott Key bridge and across to Georgetown. Our time hack was to make it to the Exorcist Steps in under 35 or 40 minutes or something. This was a little tricky since when you get to the Georgetown’s main road (M st?) you have to scoot off a block or so from a straight path – in the opposite direction of your destination – to get to the crosswalk. And of course, there was now the maneuvering of the log to deal with, on rustic city streets. We made our time hack by something like 14 seconds. Cadre Rob informed us that if we had not made it he would have had us do 10 ascents/descents. Since we had made it we were only required to do 7. We worked at a steady pace, and in a unit so as to always leave a channel for the few morning exercisers onsite. Up, the length of the rail at the top, reset the group at the top, then descend. After our 3rd set CR made us a deal; if we could pick up the pace and bang out the next 2 sets in under 3 min, we would be forgiven the final 2 ascents/descents. There was a little rearranging to make sure we would be able to move quick; 1st, at the top of the stairs now we would simply turn and come back. 2nd AK, who was quick and strong, took another individual’s ruck for the way up, and Joe, in the lead (I was just behind,) would snag it from him on the descent. After the first ascent / descent, Cadre Rob informed us we had made it, but would not tell us by how much. We rested a little, then hit it again – I at least was nervous about the prospect of more sets under much more fatigue. When the last person hit the bottom Rob informed us we had finished the first set in 1:56 and the second in 1:42. I gather some other folks felt the same way! From here we picked the log back up and took it back the 2 ish blocks to the crosswalk, then across and over the ravine to the waterfront trail, and on past Gypsy Sally’s and the waterfront, the Watergate and the Kennedy Center, up towards the Lincoln, and over and across to the Vietnam War memorial. Here Rob had us place the log down and form up tightly since it was now plenty light and with the Veterans Day holiday a band was rehearsing and there were many visitors at the Wall, and we didn’t want to in any way be perceived as disrespecting that. We took a loop through the memorial, still carrying the Jerry can and team weight. I get choked up every time, seeing all those names, each of them someone’s baby. Once through, we picked the log back up and walked it up towards the pond, a few hundred more meters. 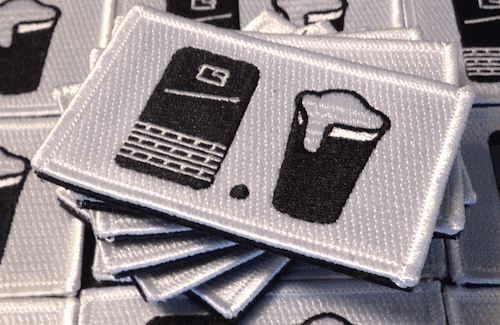 There Cadre Rob produced a stack of patches from his ruck, apologized briefly that there wasn’t going to be any sort of burn down or finisher WOD given the solemnity of the occasion, (we’re good!) expressed his satisfaction that we had 100% of our group finish (above the average of 94%,) and distributed them, each with a handshake. He informed us that we had rucked about 15 miles, plus a little over 2 miles at the beginning with the Rooney WOD and ruck to it, for a total of just over 17 miles. He collected over $400 in donations (LOL: ’what jerk donated $2?’) for Cadre Rooney, and we stood around chatting for a few minutes, then went our separate ways. All in all, an excellent experience. The difficulty of it is only now starting to sink in – many of the tasks would frankly never be something I would push myself to do as an individual. 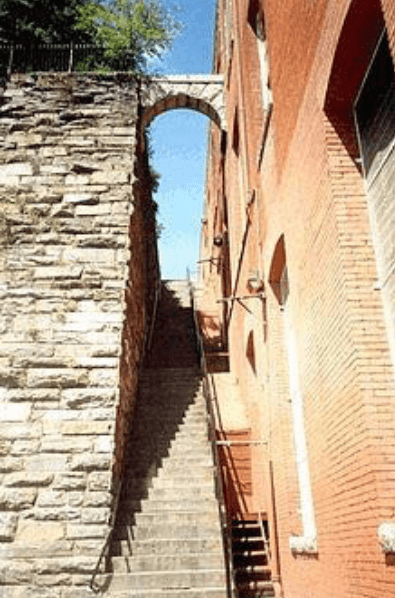 Or, if I did, I would count myself a king for having, say, hoofed up the Exorcist steps 5 times. The nature of bearing the various loads – in particular the log, which would get suddenly very heavy while carriers were transitioning – and general utility of strength and grip strength had me glad that I lift, and have in the past played with kettlebells, carries and sandbags. Most of all though, I am thankful for having taken the time to have done it, the sort of experience you can’t get in the gym and how it all gave a taste of the sorts of movements, loads, and approach to problems and collective work taken by our service personnel. In a time when it often seems like society’s greatest challenges come from an inability to work together, it was tremendously reaffirming to see and feel so concretely that we can attain remarkable feats through collective effort. 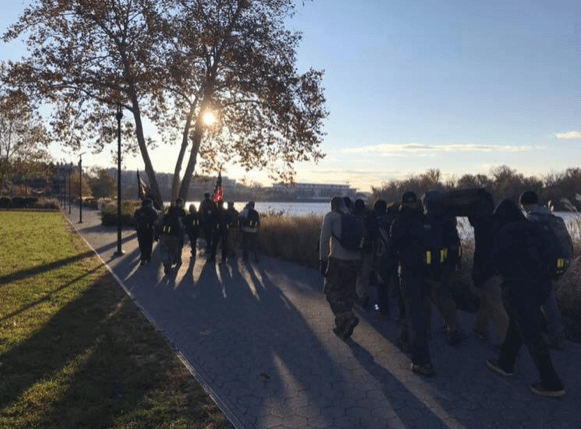 I can’t recommend highly enough that you consider trying this or another GORUCK event if you’re looking for something a little different that will get you out and working hard and well with your fellows. You can even borrow my pack and weight plate (Which I picked up at Titan Fitness, free shipping and low cost,) as needed! Prior to the last 8 years of Jiu Jitsu, I had a bit of an endurance and yoga background, running up to 50k and a 70.3 triathlon, so I have some experience fueling over long distances. For the 5 months prior to this event, I had enrolled in a 3 day a week lifting program aimed at building pretty muscle while also getting strong. In addition to this, I coach 3x week and try to get on the mat for my own training an additional 2x weekly. So all I added to my baseline volume was a pair of 3-5 mi walks with the ruck in the 4 weeks prior to the event, and the occasional HIIT session using the Brute Force Sandbag. All that said maybe my most useful workout -for my mind- was a 1-mile suitcase carry of my loaded ruck, one where I took my dog for a mile or so walk, and only allowed myself to switch hands on her stops. I set a little rule for myself, no scooting her along or anything, so I think that was beneficial in prep for the sort of slow strength and lack of self-direction that is part and parcel with this type of event. In the end, I think I went a little light and lucked out on the temperature. Had it been much colder I might have suffered. I had a Filson Anorak as a shell, an old Hind 1/4 zip I had used in past endurance events as a thermal layer, and a New Balance/Coolmax Army 10-miler tech shirt from 10 years ago up top. A pair of Under Armors and Prana Zion pants on the bottom (I had purchased a pair of ripstop 5.11s, but they ran a little big, and I wanted some stretch for squats especially, as well as the moisture wicking, given the high potential for rain and really soggy ground.) I was super happy with the Pranas. 2 pairs of socks from Sockguy, and my gym shoes, a pair of Str/ke Mvmnt Intervals, which are really light and weep well if they get wet. I lucked out by grabbing a beanie on the way out the door, which both helped keep me warm enough and supplied a nice bumper for all the log, casualty, and team-weight carrying. On my hands, a pair of Mechanix gloves.